Please be advised that our offices will be closed on Monday Dec 24th and we will re-open for business on Wednesday January 2nd 2013. Please note that our drivers will be working on Saturday December 22nd. Should you have an emergency during our closure please call Joe MacIsaac at 604-618-3714 and leave a detailed message. Joe will respond promptly to assist you. 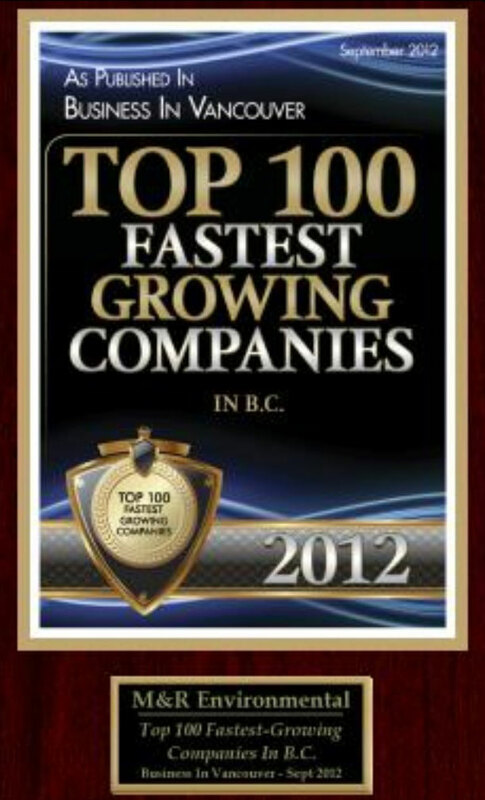 If you’d like to place a product or service order please call 604-876-0506 or visit mrenviro.com and leave us a message. We will take care of your request promptly when we return on January 2nd. In lieu of Christmas gifts this season M&R has decided to make a donation to the Burnaby Food Bank to help those in need during these challenging times in our economy. Lastly, the entire staff at M&R would like to say; THANK YOU for all of your support during 2012. It really means a lot to all of us that you continue to support our business. We look forward to providing you with our great products and services in 2013. CLICK HERE TO VIEW Adobe PDF file. In order to focus and further grow the waste petroleum related environmental services business, M&R Environmental has decided to withdraw from the Total finished lubricants distributorship. 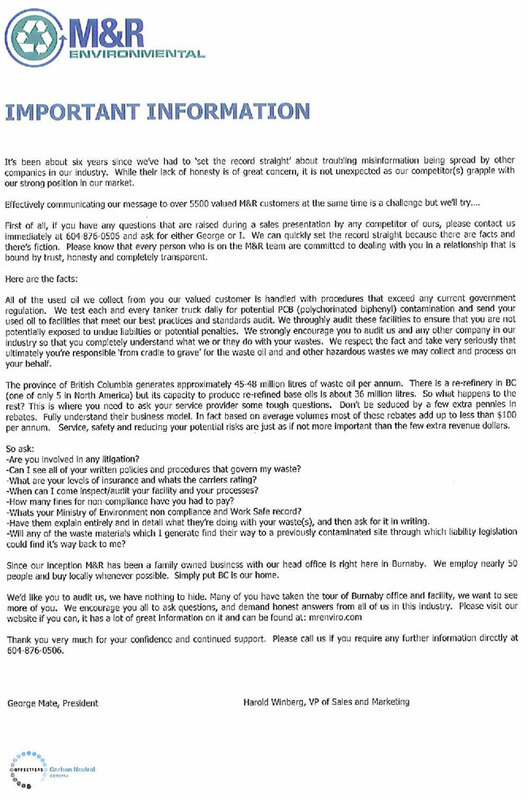 Consequently, Total Lubricants has awarded the BC bulk distributorship to Auto-Camping Ltd. effective February 1, 2012. With distribution experience since 1960, Auto-Camping will be your reliable and trusted partner for all your lubricant requirements. Auto-Camping has 16 locations across Canada, with 4 locations in British Columbia. In order to make the change as seamless as possible, a small group from M&R’s sales and operational departments will be transitioning to Auto-Camping. This will include Sunny Denison who will continue as your sales representative, and Bill Powell who will continue as your delivery driver. An Auto-Camping representative will contact you shortly in person. Your continued support during this business transition is very much appreciated. 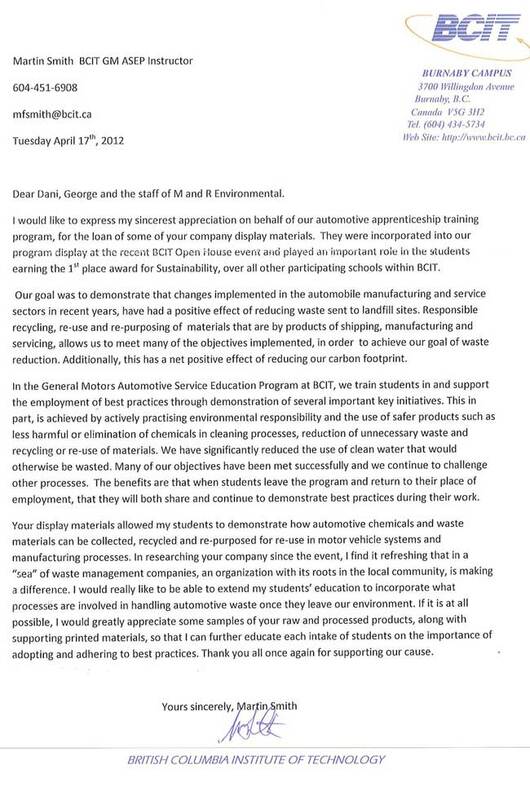 Total Lubricants Canada appreciated working with M&R and respects their decision to refocus their energies into their core business. 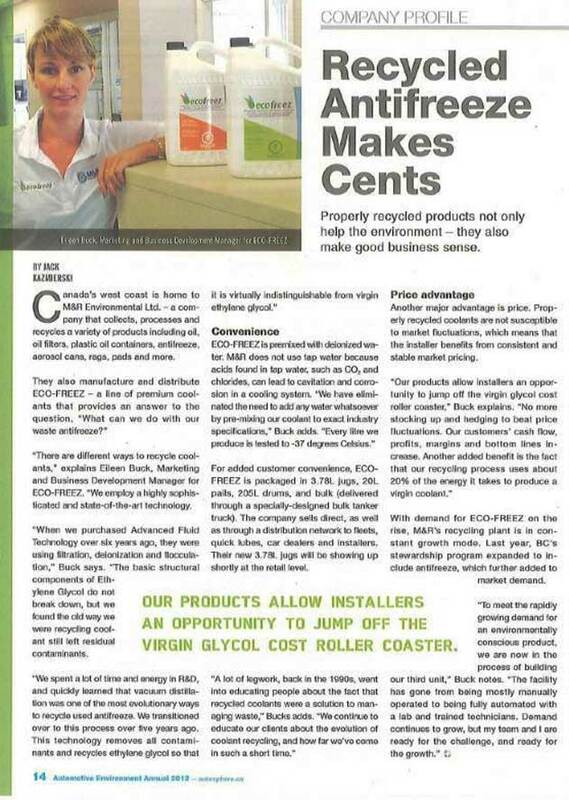 Since 1994 M&R Environmental has been a locally owned and operated company that is small enough to care about your waste, but large enough to manage it for you. Located in Burnaby BC, M&R Environmental offers it’s customers a complete management service for used oil, plastic oil containers, oil filters, used antifreeze, waste solvent and parts washer service. 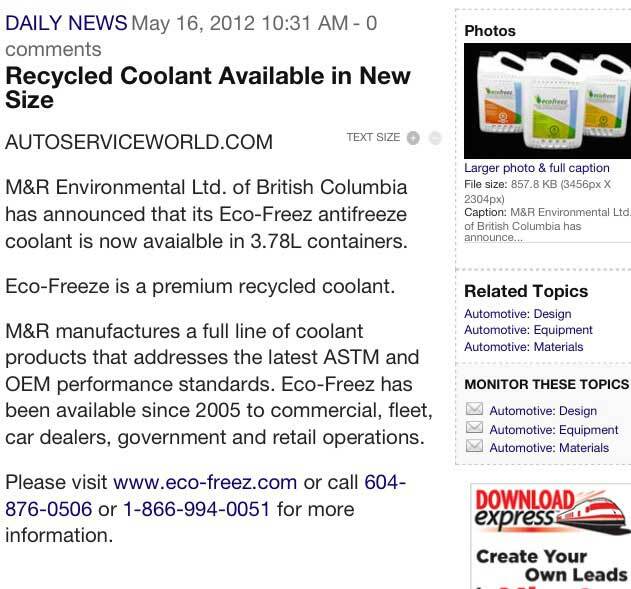 In addition M&R sells Enpac spill containment products, CUDA aqueous parts cleaners, and Ecofreez Premium Coolants. We understand our customers’ challenges and offer a specific expertise to develop waste management solutions that will ultimately translate into the development of more effective and profitable ways of doing business. Since our incorporation in 1960, Auto-Camping has become a committed leader in the Canadian automotive industry. We pride ourselves at our capabilities and commitments to provide our customers with quality lubricants and parts at competitive prices. Our outstanding service includes multiple deliveries a day as well as overnight deliveries. Auto-Camping's customers very much appreciate the knowledgeable staff and high order fill rates. We import from European original equipment producers and manufacturers and ISO approved companies. We have developed very tight relationships with our partners over the years. Our comprehensive easy-to-use electronic catalogue helps you find the desired application specific lubricant or part in seconds and enables you to place on-line orders 24 hours a day. It even tells you the status of your order. Total is a world class integrated oil and gas company operating in more than 130 countries on five continents with approximately 97,000 employees. Total is engaged in all aspects of the petroleum industry, including upstream operations (oil and gas exploration, development and production, LNG) and Downstream operations (refining, marketing, trading, future energies). Total also produces base chemicals and specialty chemicals for the industrial and consumer markets. To meet growing energy needs on a long-term basis, Total’s strategy involves deploying a sustainable growth model combining the acceptability of its activities with a sustained program of profitable investments. In Canada, Total is engaged in various sectors of activity: exploration and production (heavy oils since 1999), transformation of bitumen, petrochemicals (adhesives, resins and electroplating) and lubricants. 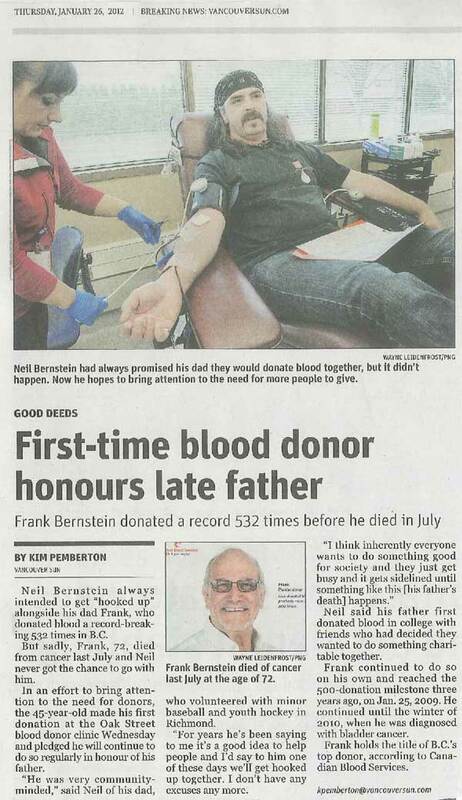 Everyone at M&R is extremely proud to see that Neil will be carrying on his father's wonderful legacy in supporting the Canadian Blood Services. Neil's father was truly a 'one of a kind' and his generosity has helped out 100's of people over the years through his blood donations. It would be great to see Neil surpass his fathers record of over 500 donations!